In many circumstances, the data in your Excel list changes and grows over time. This doesn’t mean, fortunately, that you need to go to the work of re-creating your pivot table. 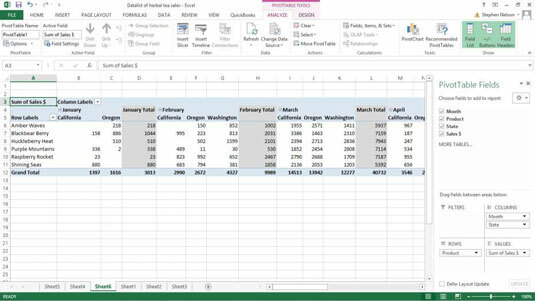 If you update the data in your underlying Excel table, you can tell Excel to update the pivot table information. Click the PivotTable Tools Options ribbon’s Refresh command. The Refresh command button is visible below. The Refresh button appears in roughly the middle of the Analyze ribbon. Choose the Refresh Data command from the shortcut menu that Excel displays when you right-click a pivot table. Tell Excel to refresh the pivot table when opening the file. To do this, click the Options command Analyze ribbon (the PivotTable Tools Options ribbon in Excel 2007 and Excel 2010), and then after Excel displays the PivotTable Options dialog box, click the Data tab and select the Refresh Data When Opening File check box. You can point to any Ribbon command button and see its name in a pop-up ScreenTip. Use this technique when you don’t know which command is which.